This tool is used to “push back” a newly-installed barrel that is pressed too far, or to completely remove a barrel from an assembled receiver. It works on calibers of all milled and stamped rifles of the AK, AKM, AK74, and RPK variety as well as the rifles with the 22,0mm longer receiver such as the M76 and the PSL. It applies exact on-center force to safely press the barrel completely out if desired and is a correct alternative to other makeshift methods that can be extremely hazardous to the chamber face. The tool is normally shipped with the GS-0005-D1 brass shoe. The GS-0005-D2 shoe is used for the PSL, Vepr 54R, etc. The customer can purchase extra units of each type for $4.00 a piece if desired. The press ram adapters I make are custom-bored to fit your press ram with 0.010″/0.012″ of clearance around the press ram. Many of the import hydraulic presses are built with a ram that is usually not the stated size as the true size of the ram can vary quite a bit for the same make and model of press. These rams are made from available metric stock that is “close” to the stated diameter and the size variance is quite broad. I keep all sizes of the press ram adapters in stock but I do not finish the bore until the time of order. What makes mine any better than the others out there? 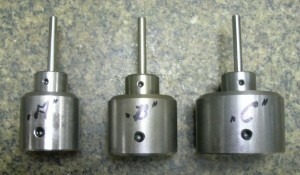 Mine have a better fit to the press ram and the tooling such as the press pins is held fast with a small setscrew. I tend to work by myself and find it difficult hold the parts in place and chase a pin around the shop floor. The setscrews are blunted so they do not damage your press ram and do not damage your tooling. Each press ram adapter ships with a diameter 0.25″ x 1″ starter dowel pin and a diameter 0.25″ x 2-1/4″ push-through dowel pin at no extra charge. When you contact me about ordering a press ram adapter, please use a beam caliper or micrometer caliper to measure the diameter of your press’ ram about 0-1/2″ from the end. I will bore the adapter to fit your press ram.